A small scapular must consist of two wool squares of cloth, connected by two strings (of any material), so that one segment rests on your chest and the other on your back. If you would like, you can wear more than one scapular at a time, so long as each scapular is complete. Once you have your scapular it is important to have it blessed by a priest and if necessary to become invested with the confraternity associated with it (A further blessing that can be granted by an authorized priest). Once you have your scapular blessed it must be worn at all times in order to share in the indulgences and privileges of the particular scapular. Should you remove the scapular for any period of time you are no longer eligible for its associated blessings, however, as soon as you resume wearing the scapular you are reinvested in its indulgences. 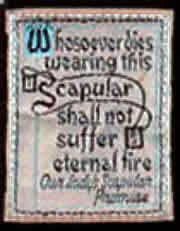 Should your scapular wear out, you may replace it with an unblessed scapular, as the indulgences are invested in the devotion of the wearer, not the object. Conferral with the scapular indicates a special devotion and consecration to Mary. No one should undertake it who is not spiritual prepared to live in accordance with it. The short form of investing or conferral consists of a priest or deacon taking a blessed scapular and while placing it over their head reciting with the person any Marian prayer (for example: Hail Mary, Memorare). The person is now invested. They are henceforth, members of the Scapular Confraternity and share in its spiritual benefits (the prayers of the members). No special daily practices are obliged, though someone consecrated to Mary, should live chastity according to their state and recite the rosary daily.